Looking at the picture up above doesn't the juxtaposition of togas and mittens strike you as a tad odd? Perhaps even staged? Perhaps even staged on behalf of Coke? Call me a curmudgeon or a conspiracist, but I can't help but be cynical about the 2010 Olympic Torch relay which like the relays of 8 of the past 10 Olympic games has been officially sponsored by Coca Cola (a brand apparently associated with the Olympics in one capacity or another since 1922). Why does Coke sponsor the Olympics? But wait, there are no Coca-Cola logos on the torch bearers' uniforms. No, but there are Coke logos everywhere else. And I know you'll probably think I'm crazy but I do question the red of the gloves. 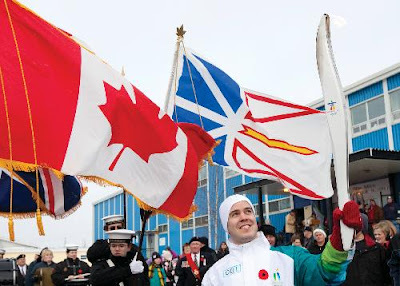 You might think the gloves are red because the Olympics are in Canada, but have a peek at the photo below and compare the red of the mittens to the red of the flag. The mittens of course are Coke Red. "strengthen(ing) existing perceptions at a subconscious level, and its identification with the brand can be used to trigger an established image." But even putting minutia like glove colour aside, ask anybody who's gone to see the Torch swing by and they'll tell you the vehicles are Coke vehicles (check out the truck at 43s in the video below), the little flags the kids wave are Coke branded flags and Coke/Olympics branded products are everywhere. So what image is Coke trying to cultivate by associating itself with the Olympics? "address obesity by encouraging active, healthy living through its products, programs and policies"
"It's something that touches very deep into the soul about the importance of good in the world and striving for your best — trying hard and believing in yourself — and all these good things you want to convey to your children and the people around you. I think it's all captured in that." Now what company wouldn't want to be subconsciously associated with that? And just to be clear, I'm not sitting up on a high horse with a mouth full of sour grapes because I didn't get to carry the Torch and I'm not even saying that I'm certain I would have turned it down if offered. Coca-Cola or not, what an incredible experience it would be to carry the thing. That said a small part of me wonders whether or not I'd have had the balls to go Sinead O'Connor on the Torch and during my relay pull out a photo of a can of Coca-Cola and rip it in half and yell, "Fight the real enemy"? What a shame that the International Olympic Committee is either not wanting or not able to find a corporate Torch sponsor that isn't in fact the antithesis of the very things the games represent - active, healthy lifestyles.